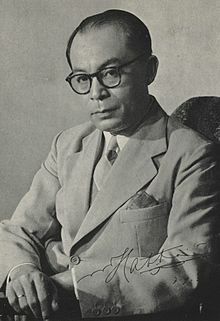 Mohammad Hatta ( listen (help·info);12 August 1902 – 14 March 1980) was Indonesia's first Vice President of Indonesia, later also being the country's Prime Minister. He fought for the independence of Indonesia from the Dutch. Hatta died on 14 March 1980 in Jakarta and was buried in Jakarta's Tanah Kusir public cemetery. ↑ Kahin, George McTurnan (1961) . Nationalism and Revolution in Indonesia. Ithaca, New York: Cornell University Press. This page was last changed on 1 August 2018, at 18:50.